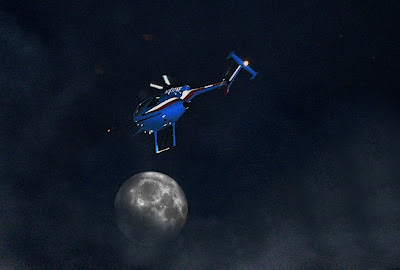 Helicopter Patrol Officers Thomas and Booth, while flying a routine patrol flight were dispatched to 24600 East Lake Houston Pkwy in regards to two missing girls. Two thirteen-year-old girls had wandered off into a heavy wooded area, became disoriented and could not find their way out. These officers arrived quickly and began a systematic search of the area using a FLIR (FLIR uses detection of thermal energy to create a "picture" assembled for video output) system that was attached to the helicopter. After only FIVE minutes of searching, the officers located the two lost girls standing on a log waving their arms. Once spotted, the helicopter officers guided the ground patrol officers to the girls and back out to the roadway. Within a matter of minutes, these officers saved the parents a very long and sleepless night. That's why being an HPD officer is worth a career! I don't mind waiting a year to get in the HPD, I'd say it's worth the wait!